Kids enjoy freedom – the freedom to explore, mingle with friends, and have fun outdoors. The good news is – scooters are designed for that. There are so many brands and options to choose from when considering skill levels and riding experience. If your goal is to gift your child a scooter that provides them oodles of fun, exercise, and encourages them to get out and socialise – we’ve got you covered. Here’s our ultimate roundup of the Best Scooter for Kids & Kids Scooter reviews that will provide you value for money and give kids an exciting riding experience. Watch your kid zip through the neighbourhood and have tons of fun while getting killer exercise. The adjustable handlebars and gender-neutral colour variants naturally grow with your kids and become their longlasting ally. This will definitely get your kids away from the TV screen to outside while providing fun and plenty of physical activity. 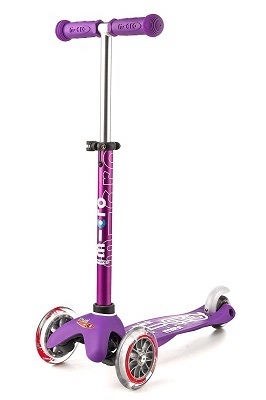 It is one of the best scooters for kids. The design is pretty sturdy, and the scooter is made from pure aluminium. It doesn’t scratch, tip, or give kids trouble in turns and twists. If that’s not enough, the composite wheel core and the non-slip ABS deck give your kids the ultimate riding experience that is seamless and smooth. 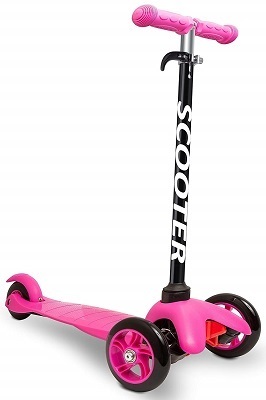 It’s the perfect Scooter for those who are new to scooting. It offers a smooth, hassle-free ride, and an opportunity to explore their surroundings with ease. The way its functional design takes your kid from beginner to intermediate while scooter-riding is what makes us like this product. Would you like your kids to scoot beside you while you take them to kindergarten? If yes, get this Razor Jr. Folding Kiddie Kick Scooter. The vibrant colours are guaranteed to capture their attention and invites a lot of fun. In addition, they won’t have to worry about losing balance since the three-wheel urethane design takes care of it. We think it’s one of the cool scooters for kids. It’s portable, functional, and has a folding mechanism that makes it easy to store. It gently builds up your kid’s hand-eye coordination, leg muscles, and dexterity as they push against the ground and zip down the pavements. It’s simple, portable, and is designed to get your kids moving. 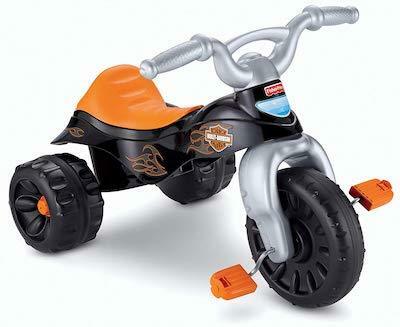 We like it since it introduces your kids to the joys of riding a scooter while encouraging them to keep moving. The slip-resistant polypropylene deck is a bonus that makes sure your kids ride safely and don’t fall off or lose balance. However, it’s not geared for absolute beginners and requires a little practice to get the hang of it. If you want your kids to pick up skateboarding or skiing in the future, get this scooter. It makes your kids use their body weight to steer and make it turn, thus improving their sense of balance as they lean left or right. 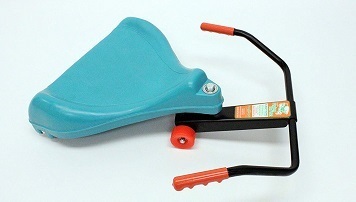 The fibreglass reinforced deck, eight colour choices, and slick anti-slip silicon logo is pure eye candy to young munchkins, making it one of the top scooters for kids. 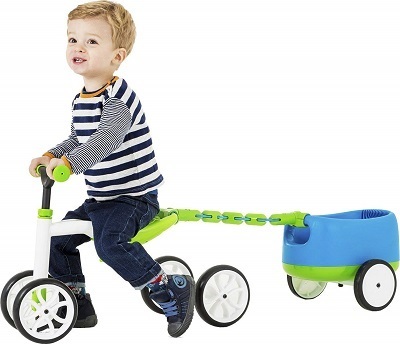 The anodised T-handlebars for these kid scooters are height-adjustable and go from 17″ to 25″. The fibreglass reinforced deck absorbs shocks and bumps while riding on sidewalks, giving kids a comfortable, smooth, and silent ride. Kids learn to steer and turn, and we love it since it’s incredibly straightforward to use. Get your child this scooter if you want him or her to stop just zipping down straight lines and get creative with zig-zags and curves. The fibreglass deck ensures a comfortable footing and parents don’t have to worry about losing stability or balance. How would your kids like to zip down the sidewalks or patios without using their feet? Introducing an innovation engineered in the 1970s, the Original Flying Turtle offers high-quality, durable steel handlebars which let kids steer and manoeuvre using their body weight. No feet or pushing business involved with these best Kids Scooters! It features comfortable seats which made from polyethene material and the skate wheels don’t scratch surfaces or leave any marks behind. It supports up to weights of 150lbs, and the handlebars are designed to be swung side-to-side. We like this product since it meets global safety standards and doesn’t require any assembly. The wheels are non-marring which mean they glide smoothly down surfaces made from hardwood, tiles, and linoleum. 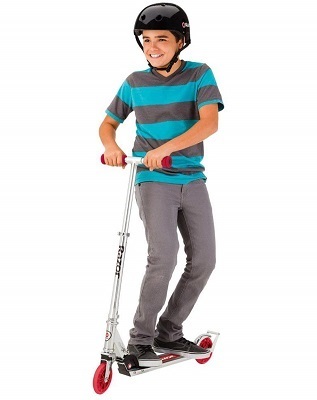 If your kids are new to scooting or too scared to try, get them this and you’ll soon see them moving. Ask your kids to try out the Razor A3 Scooter Clear if your kids want to take their scooter-riding skills to the next level. Fully rotatable handlebars and aircraft-grade aluminium lets kids twist, curve, zig-zag, and perform cool stunts without the fear of holding back. It’s perfect for using on ramps and obstacle courses, and the patented rear fender brakes quickly bring it to a halt for those sudden sharps and turns. There’s a wheelie bar included for helping kids perform tricks, and it supports weights of up to 143 pounds. We don’t recommend this for inexperienced riders or those new to scooting since this is not designed for beginners. However, for intermediate to advanced riders, it’s the perfect treat. We like this product because it’s versatile and goes smoothly over uneven terrains. 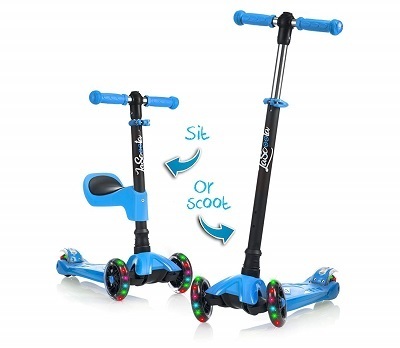 Kids can ramp or jump using the front-wheels which are premium shock absorbers and the product weights just 7.02 pounds (excluding the shipping carton). The Chillafish Quadie takes riding back to its roots by providing a simple and functional design that gets pushing and moving. A hidden storage compartment makes it easy to bring along toys and snacks while the lock-and-latch trailer gives kids additional storage space. If that’s not enough, you’ll be happy to hear that the 4-wheeler doesn’t leave any marks on surfaces and ensure a smooth and silent ride. A cool V-tube and vibrant designs make it an eye-catching entry for new riders. The seat is height-adjustable, and you can position it in different ways to ensure a comfortable fit. A sticker sheet is included to make the design more exciting while offering a touch of personalisation. It’s also available in three colours – lime, pink, and blue. We like this product since it lets your kids explore the world and have fun outside. They can even tag along with their friends and create a train-ride formation using the click-and-play connections quaddie-to-quad. The Den Haven 3-Wheel Scooter isn’t designed for the average kid. Once your child puts his feet on its uniquely designed deck, he’ll be zipping away before you know it. It is especially for experienced riders and cuts corners like a pro. The narrow deck tapers to the back and gives kids a challenge in balance and manoeuvring. Although you can use it indoors, it is geared for outdoor use which provides a lot more fun. The handlebars are padded and don’t leave any marks on walls or sides when it bumps into them. Besides that, it features a 3-wheel design, and the T-shaped handlebars lock into place. The T-bars are adjustable and reach heights of 14.5 inches to 24-inches, letting taller kids explore and have fun. We like this product since it’s the daredevil of kids’ scooters. Although it won’t make your kids reckless, it will push them to be adventurous and try out new tricks. If you want to give your child a confidence boost or improve his scooting skills, ask him to try this out. It’s guaranteed to give hours of outdoor fun. The LaScoot is a value for money addition to your scooter collection and offers a superior build quality compared to the Den Haven Scooter we mentioned before. It has a height-adjustable seat which is detachable. Kids can either stand or sit and ride on to their heart’s content. It’s perfect for 2 to 10-year-olds, and the lean-to-steer design is very intuitive and seamless. The deck gives plenty of legroom to kids, and the intuitive design makes it a crowd favourite. There’s a stomp-on brake on the rear end of the deck which makes the scooter come to a halt immediately. Since the deck is crafted from aluminium alloy, it’s a lot more durable and lasts very long. We love the fact that both toddlers and older kids can use this. It gives times ample time to master basic scooting skills, and as they progress, they can remove the seat and ride it standing. Since it features a premium build, the deck isn’t prone to bending, bowing, or buckling on impact. Scooters teach your kids to ride, have fun, and socialise. The sharp cuts, turns, and corners encourage them to explore and get good exercise. By the end of the holidays, they’ll be sweating, laughing, and meeting those physical and cognitive developmental milestones without even trying. And since these designs are durable, they won’t be breaking apart anytime soon which is another plus.